Rearguard Action, by Daniel Jew. The Rise and Fall of Pittsburgh, by Joshua Megerman. Jump Trooper: The Tarantuloid War, by Brett Drake. Going Downtown: Smart Cities in the Last War, by Daniel Oney. Forging the First Ogre, by Winchell Chung. The Final Battle, by Herb Diehr. The Ninja Shuriken, by Drew Metzger. Tabletop to Desktop, by Peter Willington. No Math CRT, by Martin Gallo. Edging Ogre, by Jeremy Filko. Clean Up, by Karl K. Gallagher. Closing the Gap (between Ogre Sixth Edition and Ogre Designer's Edition), by Drew Metzger. Notes on the Ogre, by Steve Jackson. The original designer's notes article from Space Gamer #9. G.E.V. – A Designer's Introduction, by Steve Jackson. The designer's notes, from Space Gamer. Another ^@**&?!! Ogre Article, also by Steve Jackson, contains some notes on the early history of Ogre, and notes on the Ogre Marks I, II, IV, VI, and the Fencer Ogre. Riding the Shockwave: Analysis and Strategy, by Philip Rennert, contains commentary on Shockwave, including strategy notes and recommendations for the various new units and scenarios. 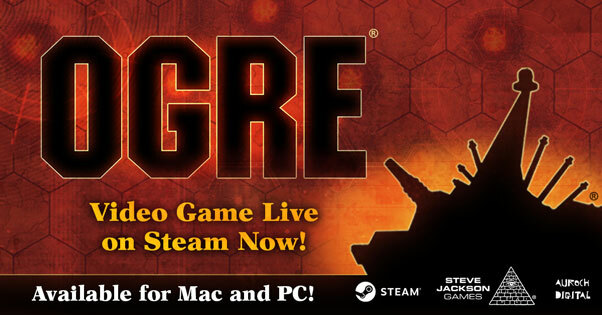 Ogre: A Review, by Robert C. Kirk. One of the first reviews, with some notes on basic strategy. Tank: Present, Future, Ogre . . ., by Charles R. Bowles. A description of trends in modern AFV development, and how they might lead to the Ogre. Ask the Ogre archives. The Q & A column from Pyramid magazine. A Beginner's Guide to Map-Bashing, by Craig York and Steve Jackson, is one part of a three-part article called Icepick. The other parts are a scenario and some fiction. Old Illuminati BBS Posts from 1992-93. General Ogre discussion and questions. Online Ogre, by Herr Wiz. Rules for playing Ogre by e-mail or conference postings. Tournament Ogre/G.E.V., by Philip Rennert, is an excellent article on strategy and force choices in the Ceasefire Collapse scenario, from a honest-to-goodness tournament winner. The Four Howitzer Defense in Ogre, by Chester Hendrix, explains how to use four howitzers to good effect in basic Ogre. How To Apply Statistical Result Resolution To Games, by Michael A. Montgomery. Very useful for rapid combat resolution and strategic and tactical plan evaluation. Playing the Odds in Ogre/G.E.V., by Roland Parenteau, is an article about using probability to maximum effect. Basic Ogre Strategy, by Steve Jackson. Strategies for the Ogre in games of basic Ogre. Basic Ogre Defense, by Michael Nahas. A guide on playing the defense in Ogre . . . without howitzers. Strategic & Tactical Objectives by Tiffin Games Ltd. Descriptions and rules for the S&TO Sponsored Counter Sheet. The Suicide Ogre: Goliath, by Tim Solis, is a set of rules for a kamikaze Ogre. A listing of new and variant armour units from assorted sources. An addendum to the above. BPC Subs, by Martin Halbert, is a set of rules for submarines and naval units for Ogre. The Uncertainty Principle: Modifications in Ogre, by Brian McCue, includes rules for playing an Ogre by the random draw of cards, and for concealed Ogre damage. Ogre Mecha, by Marc A. Vezina. Mecha Press 12. Imagine an alternate Ogre world where powered battlesuit development didn't stop until they were over 10 meters tall. Ogre, anime-style. Ogre Cyberwalkers, by Marc A. Vezina. Mecha Press 13. Another alternate world of cybertank development – giant walking Ogres striding across the battlefields of tomorrow. Airstrike, by David Searle. Optional (and very unofficial) rules for air units. Armor!, by David Searle. More optional rules, covering new missiles and armor units. Optional Sighting Rules for G.E.V., by David Seagraves. Ogre Construction Set, by Tom Warner. A point system for building Ogres. Ogre/G.E.V. Compatible Maps, by Noah V. Doyle. MacGregor's Maxim, by Jack L. Thomas. Introductory Vignette, by Steve Jackson. Duel, by Stephen V. Cole. Icepick, by Craig York and Steve Jackson, accompanies a scenario and an article on map bashing. A bibliography of all Ogre-related articles from Space Gamer, Mecha Press and Pyramid is also available. See also the section for Scenarios and the history of the Ogre world in The Last War.